The High Times Cannabis Cup, in Denver on April 20 and 21st this year, showcased marijuana culture and companies from all over the US. There was a lot to explore in this jam packed event. These are my top 10 favorites from the Cup. 10) Denver Kush Club passed out custom screenprinted Bic Lighters. Nice, DKC! Most dispensaries usually give away cheap lighters that don’t reliably work, but y’know, you can’t really complain about free schwag, right? It’s nice Denver Kush Club puts their name on a quality lighter that people will want to keep. 9) I liked Big Buddha Seeds giant Buddhist Temple in the recreational area of the Cup. Their free schwag bags said “Peace and Love” and added a calming element to the jam packed walkways. Gate gate paragate parasamgate bodhi svaha. 7) Essential Extracts budtender, Ms. Gabby. Essential Extracts shared a booth with Pink House. Essential Extracts take the high road and make water based hash from methods learned from Amsterdam hash legend, Mila Jansen. Gabby had great style. She had a great combination of street savvy fashion style and professional smarts. 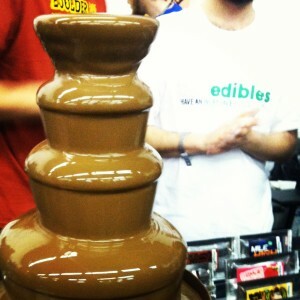 6) The Dixie Elixir and Edibles booth. My years of vending had me recognize the Dixie booth had one of the best locations of the whole Cup.The Dixie booth was nicely situated inside along one of the main traffic arteries of the event. Dixie presented a very professional and sophisticated product line that advances the concept of cannabis wellness and medicine to larger audiences in Colorado and around the country. 5) The couches and street art made chilling in the alley way between buildings a more sophisticated experience. 4) Wonder Woman tank tops from Green Man Cannabis. 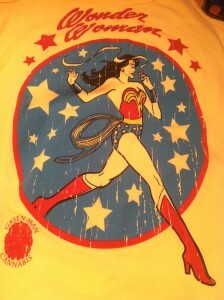 A jay smoking Wonder Woman strolls across the front of pastel yellow tank tops. 3) Hanging at the SAFER / NCIA booth with the Amendment 64 crew at 4:20 on 4/20! 2) The Free Massage chair at Riverrock. 1) The Incredibles milk chocolate and peanut butter fountains with fresh fruit skewers. I’m glad each dip was a modest 5mg dose because I wouldn’t and couldn’t stop dipping the assorted bananas, strawberries, pretzels,and cake squares into the most magnificent hash chocolate and peanut butter hash fondue fountains I could ever dream of.